There are several excellent books on powder compacts and accessories which provide historical information and value guides. They are beautifully presented with clear photographs and descriptions and provide a wonderful resource for collectors. I have two new books related to Estee Lauder Solid perfumes and Powder Comapacts. For the last 10 years I have been researching and learning about Estée Lauder collectible compacts. During these years I have met many dedicated collectors. These are collectors that are spread out all over the world. Collectors are always looking for information about these beautiful compacts but there are a very limited number of resources for this information. I decided to create an educational book that will bring the collectors needed information on these Estée Lauder items. Finally collectors will have a reference to see what is available. "The Compacts and Cosmetics: Beauty from Victorian Times to the Present Day" by Madeleine Marsh. 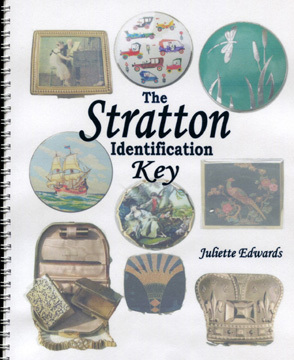 THE STRATTON KEY for sale. This spiral-bound A4 book enables collectors to identify virtually every Stratton compact by working systematically through a "family tree" of clues. It includes dates, names of models (where known), distinguishing features, accurate measurements and masses of additional information. Every model shown in colour; 64 pages. By post from Juliette Edwards. Please email Juliette for details. See members directory for address. "Mueller's Overview of American Compacts and Vanity Cases" ISBN-10: 1574325671. Its available for pre-order via Amazon and is due for release on 30th Nov 2007. Just in time for Christmas!! DK Collectables Price Guide by Judith Miller now has 4 full pages of compacts in it supplied by members Mary Turvil and Sarah Hughes.
" Collectables Price Guide 2006 - Judith Miller" - published by DK - ISBN 1-4053-0880-X. The Artifice of Beauty by Sally Pointer. A history and practical guide to perfumes and cosmetics in the past. Collector's Encyclopedia of Compacts, Carryalls & Face Powder Boxes. Volume II.